This two part program will go chair side with Dr. Michael Skinner as he utilizes the Nobel Biocare Implant protocol. Replacing teeth with dental implants has traditionally been associated with long periods of healing, high costs, discomfort, and lost work time. The latest technological advances allow the patient to leave the chair with dental implants and permanent teeth after a short one hour, non-traumatic (no incisions or stitches!) procedure. This new modality provides enhanced patient satisfaction and simplifies the dental implant treatment process. More than 35% of the population of the United States ages 65 years and older are missing all of their teeth. Patients benefit from enhanced self-esteem because they are able to speak and eat as they did when they had their real teeth. All of the downfalls associated with conventional dentures can be simply removed in a now simple, non-traumatic one-hour procedure. This procedure is the perfect solution for people that have no teeth (or will have the teeth removed) either the top jaw, bottom jaw, or both jaws. Historically, patients would have multiple surgeries over the course of 9 months to obtain what is now completed in just a few preparation appointments followed by a procedure that lasts less than one hour. The process is cutting edge: A CAT scan is done with Virtual Reality software to plan the implant placement and fabricate the final teeth before the procedure is even performed. This computer guided implant procedure allows for minimal intervention, a high degree of safety, and unprecedented predictability. 1. Define the benefit of using computer guided implants. 2. 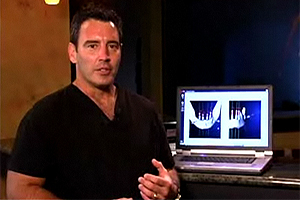 Describe the use of the CAT Scan in planning implant placement. 3. List the steps utilized prior to the seating of the implants. 4. Discuss post-op patient instructions. Rosenfeld AL., Mardearin GA., Tardeu PB. Int. J. Periodontics Restorative Dentistry. 2006 Jun: 26(3): 215-21.